Cheeky 32½km ride, stopping off near the end at our favourite restaurant, Le Pont de la Tour, for champagne, oysters and cocktails before heading home. So the Nine Streets turned over the 100km mark since buying it on my way home from work last night. Very impressed with it so far and loving all the extra quality touches like the decent light set, the mudguards and of course the fabulous paint job. There’s also something very satisfying about being first away from the lights compared to all the other bikes: something to do with the lack of inertia on the small wheels. I carry my suit in the Henty Wingman and wear one of my running jackets – currently a Virgin London Marathon training jacket – and on my legs, it’s a pair of “Gore Wear C5 Windstopper 2 in 1 Trail Pants“. These are water resistant as they’re from Gore and very comfortable. Except I can’t find a way of actually converting them to shorts, other than by – presumably – cutting the bottom bits off or rolling the legs up inside or outside. I’ve asked on their Facebook page: let’s see if we get a response. So after the test ride earlier this week, I have been doing more digging. When I dropped it off, Jack Lilley noted that the Adventure luggage was lower so maybe that was an option? 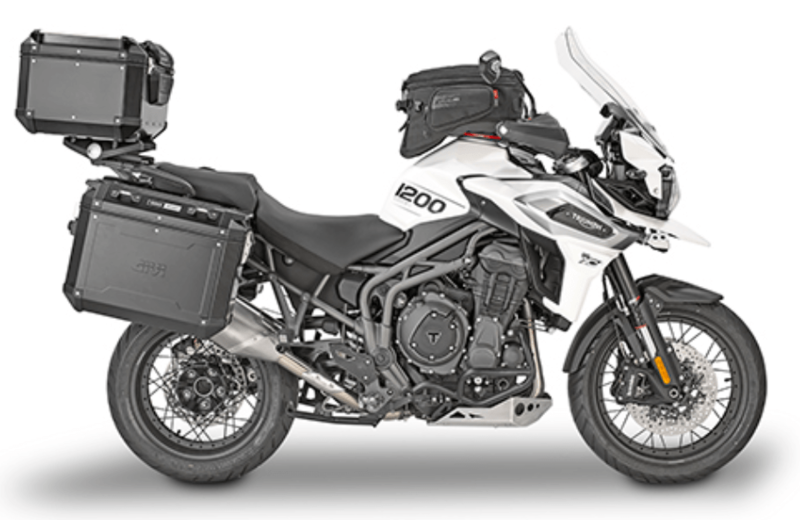 Sadly looking at the Triumph accessories online I see that whilst the luggage looks like it would fit better, it would mean a further drop in capacity, from the Expedition’s 116L (already -1L from the Sprint GT) to 97L. You can see the difference in position of the panniers between the two sets and also the way the top box – which is bizarrely canted forward – encroaches more into the pillion space the Expedition luggage. So to stay Triumph-branded luggage, the Adventure set would be the answer, but you lose nearly 20L of luggage space from the Sprint. Over on Givi’s website, their solution looks much better with the same size (or larger) panniers – they’re actually the same ones made for Triumph anyway – and a better rack system that puts the top box up higher, further back and straight up (and again, there’s a much larger top box on offer too). So maybe the answer is to go for the Triumph panniers (to keep the branding side-on), a set of Givi pannier frames to mount them further back and lower as shown in this video and a ‘matching’ Givi top box in the larger size, plus asking Jack Lilley very nicely to order me another lock barrel so one key fits the lot. Today was cold and bright: ideal to test the Tiger and its heated seats. I picked it up from Jack Lilley and headed back home to pick up my wife. They’d fitted the accessory Expedition panniers and top box as requested (more on this later). As it’s not my bike, I couldn’t wire in the Garmin so instead I just mounted a Quadlock mount and my iPhone XS for navigation duties and then we set off for the South Coast and a mix of roads. 211 miles later and we’re home – too late to return it today, so it goes back tomorrow as agreed. So then, is it a new Tiger ahoy! Well, if it were just me riding it then yes, in a heartbeat. It’s fabulous. But as we do like to ride together, i.e. with a pillion, it’s a no from me at present? Why? Seating position means little weight on the wrists – mine are bad – so all the weight on your num instead. Cruise control is excellent. A little savage when you turn it off (either by rolling the throttle forward (best) or braking (worst). Quickshifter is excellent (although my Sprint’s gearbox is silky smooth for clutch-less up changes). Luggage seemed very small, although allegedly only one litre smaller than the Sprint’s. You can only get one full-face helmet in the luggage. Clasps on the luggage were very fiddly. Panniers were way too high and forward which meant that it was difficult for me to get on an off and even worse for pillions. Also that meant that her legs were uncomfortable and my body forced her legs wide into the panniers. Top box too high and canted forward into the pillion space, so that was uncomfortable too. There’s no reason for it to lean into the pillion seat space and lose space for the rider and pillion together. Given the luggage is Triumph-branded Givi luggage, it’s unforgivable that the Givi frames are lower and further back, exactly what’s needed! And why should you pay an extra £152 to get the frames after you’ve spent £820 on the panniers themselves (unforgivable on a touring bike)? Now, what about that mounting plate for the top box? Another Givi one maybe? But as it is, the Tiger 1200 is not good enough for me. It was lashing down this morning, so instead of running out from Fisherman’s Wharf, I had to use the hotel gym instead. Booooo! Despite precious little exercise since the start of the new year, weight is only up 0.2kg to 93.4kg.